Not The Barnet Times: One law for us. One law for them. The picture below was taken on Saturday outside the venue of the East Barnet Festival. The car parked on the pavement belongs to Cllrs Andreas & Joanna Tambourides who were both in attendance. Joanna Tambourides is the Assistant Cabinet Member for Transport. What a good example she is setting! True, but to be fair speeding isn't something the Council enforces and issues tickets for, the Police do. The Council gets heaps of cash fining people for parking just like this so you would have thought Councillors would stick by the rules THEY set, no? This is not a rule the Council sets. It is part of the Highway Code that it is illegal to park on the pavement. When I was a Councillor the policy was to take a local decision on whether tickets should be enforced. Councillors were advised before drivers were fined for parking on the pavement. In Edgware unless it was clear that the pavement was being blocked, we took the view that drivers should not be penalised as they were usually parking on the pavement to ensure that the road was not blocked. Firstly the Highway Code is guidance. Any prohibitions have to be in statute. The Council controls where it is and isn't ok to park on the kerb. Where it is they have the signage to inform the motorists that you are aware of but everywhere else it is not permitted. Where enforcement takes place is a different matter. 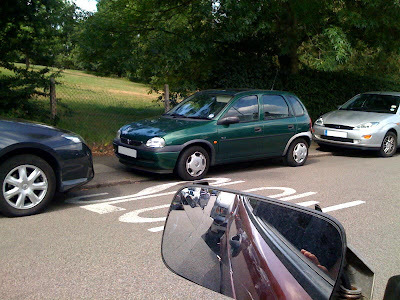 We had a hilarious case in Brunswick Park where it was customary for the cars to be parked down a street. Brian Salinger, driving through, spotted a very badly parked lorry and rang it through whereupon the Council went and ticketed the whole street! That wasn't fun. Back to the case in hand. As the Council has not (at it's own discretion) granted permission for people to park up on the kerb then it has said that parking on that kerb is prohibited and, if caught, you will be ticketed. Officers and and should exercise common sense in regards to enforcement given local circumstances but that doesn't mean that as people aren't ticketed it isn't contrary to the Council's policy - they just turn a blind eye in the same way the police may do to certain minor offences. Why did they need to drive to Oak Hill Park anyway? When Joanna Tambourides stood for election in East Barnet Ward she claimed to live "a stones throw from Oak Hill Park". If she can throw a stone that far why hasn't she been selected for the Olympic shot putt team? Anonymous, I think that must have been a VERY big stone thrown by a very big hand - they live in another postal code district to the Park! Click >> http://url2it.com/rnq according to Google Maps it's just under a mile door to door and 16 minutes to walk. A rather dubious statement on election publicity, presumably to try and avoid the fact that no East Barnet Ward councillors actually live in the ward! Barnet Council, I believe, have a policy to allow residents to park on the pavement (just ignore the pedestrian)if they think it will allow cars to speed unihibited along once pleasant suburban streets. In Cllr A Tambourides Brunswick Park ward we have a situation that in one street residents are allowed to park on the pavements whereas in an adjoining road the residents are banned from parking on one side of the road. This is nothing to do with improving the quality of residents lives but simply put these are measures to allow vehicles a high speed 'plain sail' through the neighbourhood. The result of this disrespectful & treacherous policy = Rat Runs. The Tambourides are obstacles in the way of civilised progess and the residents of my road are slowly realising they have been duped by these people and suffice too say I will be mobilising the forces in time for the local May elections next year.